Finland holiday cottage. 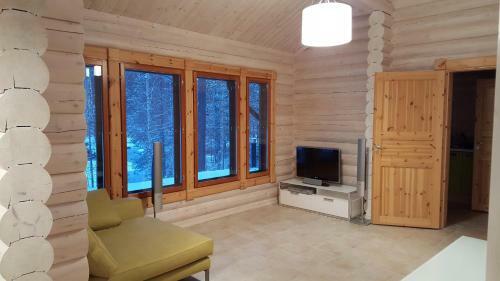 Saimaa Lake Cottage is situated in Niittylahti and offers barbecue facilities. The holiday home is in an area where guests can engage in activities such as skiing, cycling and fishing. The holiday home has a satellite flat-screen TV, 2 bedrooms and a living room. The kitchen is equipped with a dishwasher. At the holiday home guests are welcome to take advantage of a sauna. Hiking is possible within the area and the property offers ski storage space. Savonlinna is 12 km from Saimaa Lake Cottage. The nearest airport is Savonlinna Airport, 11 km from the accommodation.